Maryland is the nation’s leading employer of scientists and engineers, home to renowned healthcare organizations such as Johns Hopkins Health System, and boasts the country’s top performing public school system—all strong contributors to the state’s ability to attract workers. Vocational and trade programs in the state are designed to support regional economic priorities, with career and technical education programs offered at a variety of institutions, including high schools and career colleges. If you are interested in earning a vocational certificate in Maryland, read on to learn more about the programs and jobs available. The following ranking serves as overview of the vocational and trade schools available to students in Maryland. Fast-growing job sectors in Maryland include allied health, manufacturing and construction, all of which can be studied at vocational, trade and career colleges in the state. 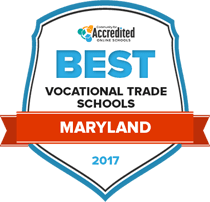 Our rankings of Maryland trade schools are based on criteria that matter most, including student-teacher ratio, financial aid options, tuition rates and the like. Hagerstown Community College was Maryland's first community college when it was founded in 1946. Transfer, continuing education and career courses are taught at the school. Among the career programs are advanced manufacturing systems, emergency medical services, engineering technology, industrial studies and nursing. Approximately 20 general education credits are built into the programs. The general education classes are included in each semester curriculum, alongside degree-specific courses. Moodle, WebAdviser, Testing Center and the Learning Support Center are resources that house course schedules, tutoring support and exam scores. Transcripts are retrieved upon request through the administration office. Located in central Maryland, the Community College of Baltimore County provides career and vocational training, workforce development and continuing education instruction. Shuttle and city bus services are available to and from the college. Catonsville, Dundalk, Essex, Hunt Valley, Owings Mills and Randallstown are the college's six campuses with Essex being the school's main campus. More than 200 two-year degrees and certificates are offered. Aircraft dispatcher, automotive technology, construction and occupational safety and health technology are types of fields in which degrees are available. Some of these degrees have a global option. Pathways is the program the college uses to help students keep their classes aligned with career goals. Baltimore City Community College is a state-sponsored school that has one main campus and several satellite locations. The school was founded in 1947 and offers associate degrees in computer-aided draft and design, physical therapy, robotics and electrical engineering. After earning an associate degree from the college, students can transfer to local state schools without losing credits. Learning outcomes give adults a solid foundation of general education and degree-specific knowledge and skills. Courses use a combination of lecture and hands-on laboratory training. Career and technical education (CTE) programs are a valuable resource for those interested in pursuing an undergraduate degree or seeking to jump-start their professional careers. Several types of programs are offered in Maryland, ranging from high school programs to adult learning opportunities. Use the search tool below to find a school near you. According to the U.S. Department of Education, Maryland had 159,985 students enrolled in career and technical educational programs during the 2013-2014 school year. In 2014, 60 percent of vocational and trade school graduates also completed the course requirements for the University System of Maryland. High school students who were enrolled in a CTE program had a 99 percent graduation rate in 2012-2013. Maryland leads the nation in scientists and engineers as a percentage of the workforce, and the state’s vocational and trade programs have grown to meet this demand. Vocational programs in Maryland are offered at many public high schools, community colleges and private career colleges, as well as through apprenticeship programs. Students are well-positioned to earn good wages upon graduation; in fact, nine of the 10 post-secondary and associate degree fields with the most job openings in the state command salaries higher than the national average. Maryland’s job market reflects the state’s emphasis on education and advancements in health sciences, with particularly strong demand for nurses and medical technicians. In fact, more than 189,000 healthcare professionals are employed in the Baltimore area alone. Also encouraging for Maryland workers is the fact that their median annual wages tend to be higher than the national average in careers available to those with sub-baccalaureate certificates. To gain further insight into career opportunities for vocational and trade school students after gaining certification, compare the job openings, growth outlook, and salaries for some of the top careers in Maryland. The greater Baltimore region, home to 2.7 million people, is the key economic center in Maryland. The city’s proximity to Washington D.C. has fueled the growth of government agencies in the city, and subsequently the associated information technology business. The city has also experienced growth in the tourism and hospitality industry, as well as financial services, trade and transportation, and business services. Top employers in the area include Johns Hopkins University, Johns Hopkins Health System, University of Maryland Health System, MedStar Health, and the security firm Northrop Grumman. Prospective students in Baltimore can choose between several public and private schools offering vocational certificates that support the workforce needs created by the area’s major industries. The Community College of Baltimore County and Baltimore City Community College are public schools offering the widest range of programs to students. The most popular areas of study are health sciences, criminal justice, information technology and computer sciences, and business administration. Smaller, private schools such as All-State Career - Baltimore and Fortis Institute – Baltimore offer a more limited number of programs but see similar trends in terms of popular programs, including healthcare, computer sciences and transportation. More specialized areas of study are available through the Baltimore Studio of Hair Design and the Holistic Massage Training Institute. Students interested in the fields such as construction, mechanical technology, industrial maintenance and transportation can earn certification at North American Trade Schools. A resource for students, parents and staff that provides an overview of CTE programs available through the county’s high schools. A compilation of information about vocational and trade programs, including course descriptions, curriculum resources, and program requirements for both secondary and postsecondary programs. Offers opportunities for continuing education, legislative advocacy, and networking for registered nurses. Provides a comprehensive explanation of the state’s educational opportunities, including CTE and other degree programs. Prospective students can also find additional resources for specific areas of study such as business or agriculture. Comprehensive job resource for Maryland residents. Offers job search database, employment training opportunities and labor market information for those seeking employment. Prospective students can find information about programs of study, financial aid, transfer of credits, and where CTE programs are offered.